Poor road conditions have cost consumers and the insurance industry at least $27 billion over a five year period, according to a 2014 survey commissioned by Trusted Choice® and the Independent Insurance Agents & Brokers of America (IIABA or the Big “I”). The survey also reveals that from 2009 to 2014 half of car owners experienced damage to their vehicles as a result of potholes. As millions of Americans encounter potholes as the rough winter wraps, Trusted Choice® urges drivers to be cautious now and as repairs continue. The snow, ice and freezing rain during the rough winter months left their mark on our roads in New England and across the country. 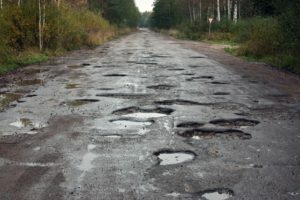 Severe potholes have led to accidents which may impact insurance rates, as premiums are determined by past claims, accidents and driving violations. Potholes and poor road conditions aren’t just an inconvenience; they are an expensive and dangerous result of harsh winters. A Trusted Choice® independent insurance agent can help you select the coverage that best suits you and your vehicle by helping you evaluate your insurance needs and risks. Union Mutual Companies are a local Trusted Choice® carrier that represents multiple insurance companies, so it offers you a variety of personal and business coverage choices and can customize an insurance plan to meet your specialized needs. This firm adheres to a pledge of performance, committing them to providing excellent customer service.